WEST WARWICK, R.I.--(BUSINESS WIRE)-- AstroNova, Inc., (NASDAQ: ALOT), a global leader in data visualization technologies, today announced that AstroNova Test & Measurement has launched an upgraded TMX® data acquisition (DAQ) system, featuring enhanced security with Windows 10 and a high-speed oscilloscope for 60x faster measurements. AstroNova's upgraded TMX® data acquisition system features enhanced security with Windows 10 and a high-speed oscilloscope for 60x faster measurements. (Photo: Business Wire). Obtain measurement data in less time with an all-in-one system. TMX is a complete solution with everything needed to acquire, visualize and analyze data quickly. Increase test coverage and reduce costs by eliminating the need to purchase a separate instrument for high-speed measurements. The 2-channel scope card extends the sampling rate to 50 MHz for 2 channels. Reduce file sizes using advanced triggering capabilities and multiple sampling rates. The embedded scope makes it easy to capture high-speed events while simultaneously sampling at lower rates for long-term trending. Achieve greater security with the Windows 10 operating system, in compliance with U.S. Department of Defense standards, designed to strengthen cybersecurity and streamline the IT operating environment. Easily exchange drives for recording of classified and non-classified data. Review and analyze data quickly with the built-in 17” touchscreen display. QuickLook data compression technology allows users to scroll through data in seconds without interrupting the current acquisition. The TMX is an all-in-one, out of the box DAQ solution designed to acquire, visualize and analyze data. Tested to MIL-STD-810F standards, it will withstand the rigors of field testing, production environments and lab work. With its user-friendly software, the TMX has proven itself year after year, becoming a trusted and reliable solution for critical industry-leading applications around the world. 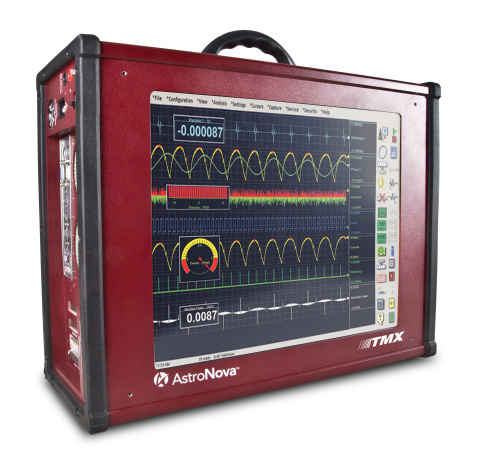 To learn more about the TMX or our other solutions, please call us at 401-828-4000, email daq@astronovainc.com or visit us online at https://tm.astronovainc.com/.